On September 18th, leaders of the two Koreas have met in Pyongyang, North Korea, for the third meeting for inter-Korean reconciliation. With the international attention focused on the movements of the two leaders, families around the world expecting the peaceful reunification of the Korean peninsula, further world peace attended a peace festival held in South Korea. 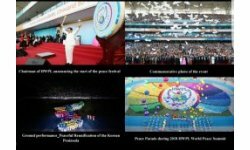 The peace festival with the theme of “Heavenly Culture on Earth, Onward to a World of Lasting Peace” was held at Incheon Asiad Main Stadium in South Korea, a spot of 2014 Asian Games. On the occasion of the 4th Anniversary of the WARP Summit, this outdoor event invited world political leaders, religious leaders, social representatives women and youth groups, educators, media along with citizens across the country. Started with the trumpet sound of a marching band that signaled the era of peace has come, the daylong festival continued with the various cultural performances such as Korean folk music tradition called ‘Nongak’, 12 different peace parade, and Korean traditional dance performance. 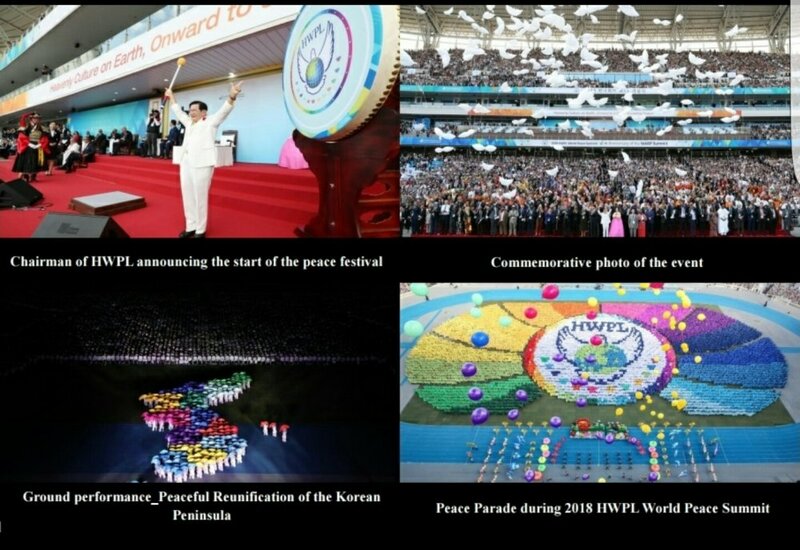 According to the host organization, Heavenly Culture, World Peace, Restoration of Light (HWPL), the peace parade contained the message about the peaceful world that the global village dreams of achieved through religious harmony, peace education, and international law for peace. In the parade, the performances of young people who wish to spread a culture of peace through peace education followed by the performance of urging 'OK' sign to establish international law for peace based on the DPCW. In particular, a parade featuring the desire for peaceful reunification of two Koreas with 70 years of division attracted spectators around the world. Collecting international supports for a unified one Korean state by peaceful means is one of the HWPL’s peace initiatives. Following the live broadcasting of the on-the-spot participants 97 cities in 39 countries including Germany, India, Australia, South Africa, France, El Salvador, and the USA, dignitaries of international society delivered the congratulatory messages to the audiences. In his address, H.E. Donald Ramotar, Former President of Guyana, stressed on the collaborative efforts for the world peace as well as the reunification of Korean Peninsula. “I am particularly happy that one of the emphases of your work is to get the ordinary women and men involved in the work and struggle for world peace. Many times, we have seen that it is through our collective voices and representation of progressive leaders that changes can be made and resources can be diverted to raise the quality of life and standards of living of humankind.” “It is most gratifying to see Korean people united in sports and families are once more able to meet and greet each other. I wish to extend my support to all of you working for this unification of this great land. I am happy to be here at this time and hope to return to see the border which now separates the two Koreas, will be turned into a line of the unity of your people and century.” H.E. Viktor Yushchenko, Former President of Ukraine, said, “Together with you, we feel the pain of your people unfairly divided by the two great empires and pray for the unification of your country. I believe that peace is approaching every day due to the indefinite activities of Chairman Man Hee Lee of HWPL and his organization, as well as the genuine desire of millions of people. I sincerely thank you for the fact that your organization is carrying the peace initiatives with the concrete action plans. The DPCW is a perfect and balanced document that can be the basis of solidarity for peacekeeping in all countries of the world. I think all the leaders of the countries should support the DPCW.” At the end of the festival, the whole stadium was filled with the lights and the chants of 100,000 attendees, shouting “We are one!” wishing for a harmonious world of peace. Chairman Man Hee Lee of HWPL, the host of this festival, delivered his thanks message to the attendees, saying “I have noticed that no one in this world wanted war, but everyone wanted peace. Hence, I am certain that peace will be achieved. Journalists, former and incumbent presidents, chief justices, university chancellors, ministers of education, presidents of parliaments, and mayors of different cities and nations have expressed their endorsement of the 10 articles and 38 clauses of the DPCW, and they are signing MOUs with HWPL. I would also like to express my gratitude to politicians, religious leaders, and heads of organizations for supporting the peaceful unification of the Korean Peninsula and the DPCW, and working together with HWPL shouting, “We Are One!”.